Boat International's sister magazine Dockwalk received a photo on its Facebook page last week on Thursday, October 31, of a vessel allegedly on fire at the STP shipyard in Palma de Mallorca, Spain. In an update received from an STP spokesperson, the fire took place on a 27m yacht that was in the shipyard for refit and maintenance. 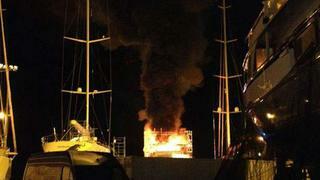 The vessel caught fire at 8 p.m. and the flames spread quickly. According to the STP representative, '…The STP emergency team activated the emergency protocol and after no more than two hours, the fire was extinguished. Up today, we don't know anything exactly about the reason for the fire; police are investigating.' Despite the yard being full, no one was injured in the fire and no other vessels suffered damage.